Preface. 1. Understanding latent phenomena (E. Risvik). 2. Experimental design (E.A. Hunter). 3. Preference mapping for product optimization (J.A. McEwan). 4. Analysing complex sensory data by non-linear artificial neural networks (K. Kvaal, J.A. McEwan). 5. Relationships between sensory measurements and features extracted from images (K. Kvaal, P. Baardseth, U.G. Indahl, T. Isaksson). 6. Analysing differences among products and panelists by multidimensional scaling (R. Popper, H. Heymann). 7. Procrustes analysis in sensory research (G. Dijksterhuis). 8. Generalised canonical analysis of individual sensory profiles and instrumental data (E. van der Burg, G. Dijksterhuis). 9. Defining and validating assessor compromises about product distances and attribute correlations (P. Schlich). 10. Analysing individual profiles by three-way Factor analysis (P.M. Brockhoff, D. Hirst, T. Næs). Index. 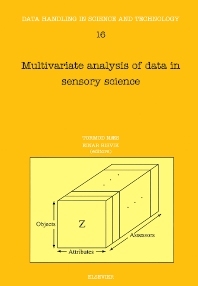 The state-of-the-art of multivariate analysis in sensory science is described in this volume. Both methods for aggregated and individual sensory profiles are discussed. Processes and results are presented in such a way that they can be understood not only by statisticians but also by experienced sensory panel leaders and users of sensory analysis. The techniques presented are focused on examples and interpretation rather than on the technical aspects, with an emphasis on new and important methods which are possibly not so well known to scientists in the field. Important features of the book are discussions on the relationship among the methods with a strong accent on the connection between problems and methods. All procedures presented are described in relation to sensory data and not as completely general statistical techniques. Sensory scientists, applied statisticians, chemometricians, those working in consumer science, food scientists and agronomers will find this book of value.